As the experimental multi-instrumentalist prepares to release an envelope-pushing solo album and play the Quietus-partnered Big Ears Festival in Tennessee, he takes us through 13 LPs that have shaped the journey so far. 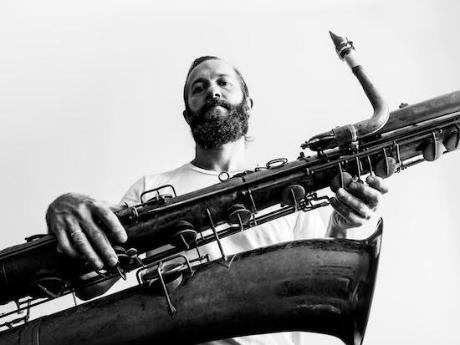 The first time you see or hear Colin Stetson perform, it doesn't seem possible. He manages to manoeuvre through an assortment of genres, sounding like an ensemble of musicians, when really he's just one guy with a saxophone. Getting to that point has taken years of determination and physical training, combined with a technical prowess honed both on stage and in the studio. It has also meant blowing away all preconceptions of what the instrument is capable of. New album All This I Do For Glory – the 41-year-old's first solo release since 2013's incredible New History Warfare Vol. 3 – sees him push his own boundaries further than ever before. An opportunity to be guided through the albums that have informed this musical powerhouse, then, feels too good to resist. Stetson – who grew up in Ann Arbor, Michigan but has lived in Montreal for the last 10 years – is as serious about his craft as you'd expect. But he's also a pleasure to speak with: incredibly intelligent, polite and good humoured. The following 13 albums comprise an eclectic mix – from Enya to the Pixies, Prince to Autechre – that have either directly informed his latest work or have repeatedly proved inspirational in the bigger picture. Either way, they have been absorbed to an intense degree. "One of the things I've always used as a tool in life and music is the adage that you are what you eat," he says. “Every time I step up to do a new project, I identify certain sounds or ideas that I'd like to see present in whatever I'm working on. Then I just consume them regularly. These are some of the things that have meant something to me along the way." Colin Stetson plays this year's Big Ears Festival in Knoxville, Tennessee between 23rd and 26th March 2017, for more information go here. All This I Do For Glory is out April 28 on 52Hz via Kartel Music Group. Click the photo below to begin going through the album selections.